Write ups on past events. Post Christmas walk and meal. Contact: Robert & Julie - 01622 859359. 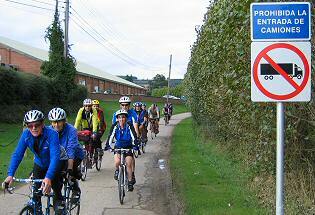 This event took place on a day that was (as it turned out) much more fun for walking than cycling. 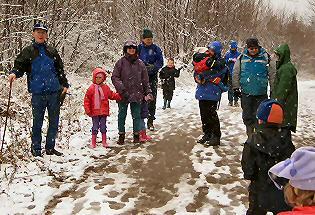 It was a bright winter's day in which 7 children and 8 adults took a gentle stroll through the Kent countryside high on the North Downs accompanied by falling snow. Great fun was had with snow balls. 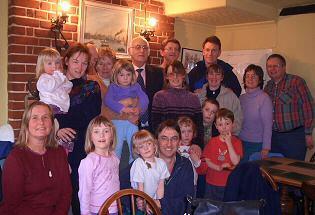 Later, this group were joined by other more staid friends for the meal in the The George pub in Molash. meet 9.45 for 10am start, at Ditton. Nearest Railway Stations are East Malling or Aylesford. Ride distance approx. 35 miles. Contact: Mark & Liz - 01732 848432. Seven tandems and one solo started out from Ditton, Kent on the day the clocks "sprung forward" for this joint Kent and South East London regions’ ride. Liz and Mark led us through lovely lanes, ending with a good sprint along a surprisingly quiet dual carriageway to a garden centre on the outskirts of Paddock Wood. With excellent timing Betty and Ernie joined us here for coffee (they'd craftily missed out the hills) now making us 8 tandems for a while until Kevin and Barry left us. After the coffee break, there ensured more little lanes, lambs, daffodils and primroses and then lunch at the Woolpack Inn at Benover. Betty and Ernie peeled off homewards before the hill and then the mobile phone rang whilst we were half way up the hill with Liz (of Ken & Liz) announcing that they'd got a split rim so would carefully make their way back to their campsite and miss out on tea. 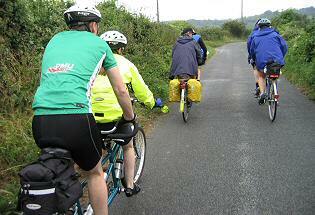 The remainder of us rounded off a very enjoyable 30 miles with tea and cakes at Liz and Mark's house. meet 9.45 for 10am start. Ride distance approx. 40 miles. 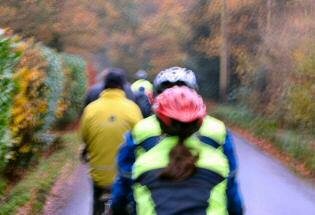 Despite rain and wind, 5 tandems and 1 solo left the start at Harrison's Rocks. There should have been more but the weather did have its effect. After a couple of loops around some pretty steep hills we stopped at the Pantiles in Tunbridge Wells and took our wet selves into a coffee shop for a welcome break. Shortly after the break we stopped off for some sight seeing at the strangely shaped Toad Rock and then continued via a few more hills, some wet tracks and more rain to our lunch stop at Speldhurst. To our pleasant surprise, five of the participants whom we'd expected at the start, were already at the pub, having missed us at the start by being more than 15 minutes late. 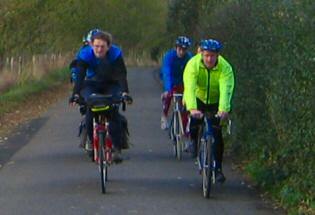 We were now 7 tandems and a solo (a total of 16 people). The afternoon incorporated a tea stop at St Ives Tea Shop at Hartfield (where we completely filled the little place) and a longish section of the Forest Trail. During the day we seemed to do a lot of miles but as we had several long stops, eating, drinking and sheltering from the rain, we actually only did 27 miles. Despite the weather it was a fun day out. 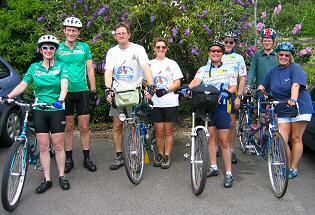 Four tandem teams met at Marden on a wonderfully sunny, hot day. Ernie & Betty led us through the labyrinth of little lanes in this area with never a real hill to deal with, just an occasional railway bridge. The countryside was looking absolutely fabulous with many flowering trees and bushes and the stunning greens of the leaves. 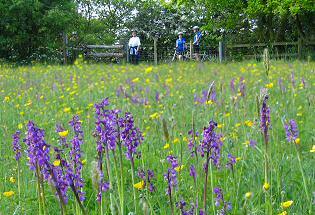 Our coffee stop was at Iden Croft Herbs, Staplehurst where teabread was enjoyed and the plants and herbs admired. 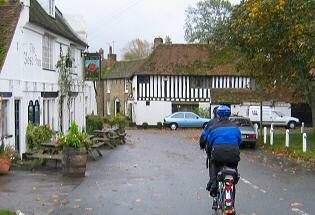 Another hour of sociable cycling brought us to the George pub at Bethersden for an excellent lunch - roasts with trimmings and many platters of vegetables all carried out to the garden for us. Our final stop was at Grafty Green Garden Centre for tea. 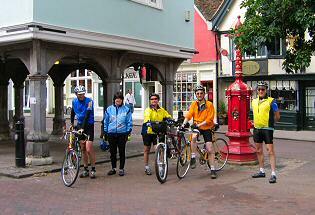 It was a good ride with very enjoyable refreshment stops and we achieved 38 miles on arrival back at Marden. 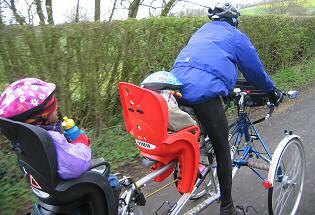 It has to be said that this was not our best attended ride with only 2 tandems and a solo taking part. Nevertheless, it was a good ride which took us in a semi circular loop via Chilham, where we stopped for coffee, to Canterbury and then via the Crab and Winkle Trail to Whitstable. 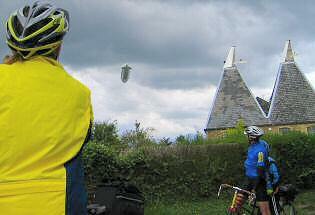 Not long after the start, a photo opportunity presented itself with an airship flying low overhead. We had some inclement weather on the way and a couple of punctures and it was way past 2 o'clock when we stopped for lunch in Whitstable. We had by now done most of the riding leaving about 7 miles remaining to return us, via Seasalter, to the start and our leader's house for tea and cakes - having completed some 38 miles in all. Four tandems convened at the start in West Malling and set off purposefully, in light warm rain, towards the North Downs where, after passing through Ryarsh and Birling we took the 14% rise to the top at Vigo and then we flew back down again via Trottiscliffe, Addington and Wrotham Heath to a coffee stop at Nepicar Farm. 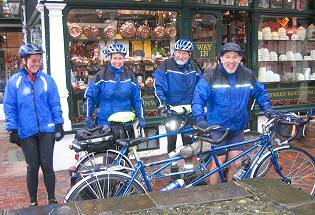 We were fortunate that the worst of the day's rain fell whilst we were having coffee and had eased by the time we left. After many leafy lanes and after passing through Platt, Plaxtol and Ivy Hatch, we arrived at Stone Street, where we stopped for lunch at the Padbury Arms. During our lunch stop the weather took a distinct turn for the better and the afternoon's ride was mostly in brilliant sunshine. It was also much flatter, travelling as we did through the towns of Hadlow, East Peckham and Yalding - where we stopped for tea. 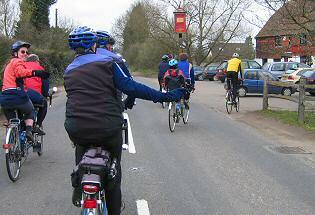 The final leg back to West Malling passed through Wateringbury. 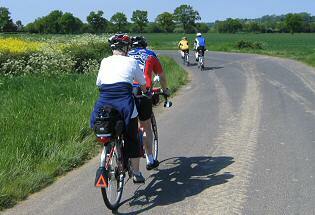 It was an excellent day’s ride and covered 42 miles. 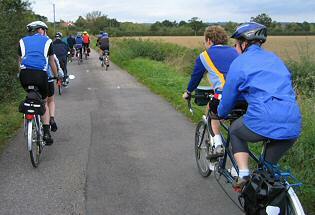 This joint ride for Kent and South East London saw a very good turn out of 9 tandems. 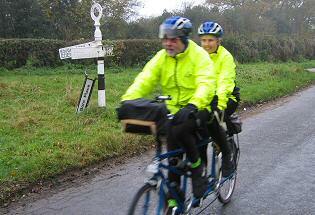 Ernie & Betty led us out from Marden at a fast pace, weaving around the quiet little lanes to arrive at Biddenden Vinery for coffee and cakes. These lanes are wonderful for social cycling as it is usually possible to ride 2 abreast and chat, whilst keeping a careful eye out for sharp corners coming up and the very occasional vehicle. We returned nearly back to where we had started for lunch at The Wild Duck Inn at Marden Thorn, where we were seated at a very long table in their rather posh restaurant with pretty pink table cloths and napkins. After a leisurely lunch Ernie & Betty took us north towards Linton and up a little lane with a sign in Spanish at its entry prohibiting lorries: this was a "there and back" trip to gaze upon the splendours of a large house overlooking a lake with 3 fountains and many geese and ducks (there's a fruit distribution company next to this lane and we imagined the owners of the "posh" house must have got fed up with large Spanish lorries trying to find the correct access)! 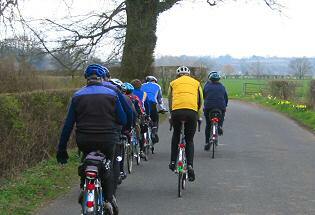 We continued onwards for tea and cakes at Yalding Organic Farm before returning to Marden to complete 45 miles. 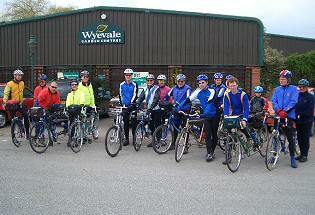 There were a few slightly "numb bums" due to the fairly flat terrain of the day but we all had a very pleasant day out. 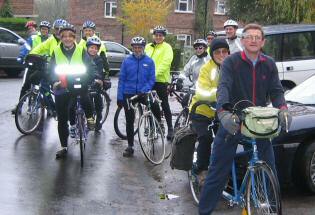 It had been a very wet and windy day and night prior to our October ride and was still drizzling on Sunday morning, which we think must have put off some of our hoped-for participants. 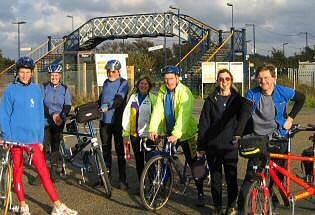 For Kent and South East London regions' joint ride 4 tandems and 1 solo met in Bekesbourne (east of Canterbury) station car park, by which time the rain had stopped. Peter & Sally led us past Howlett's Zoo (we couldn't really glimpse the gorillas), through Littlebourne to the beautiful little village of Wickhambreaux. From there it was northwards along little lanes beside open fields before looping southwards through Preston (in Kent!) 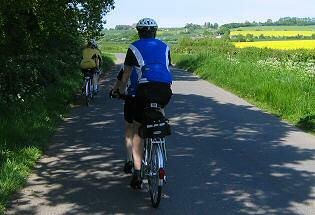 to our coffee stop just outside Wingham in The Railway Station Farm Shop (no railway line in evidence) and café. We emerged to a light drizzle, which soon stopped, and continued along tiny, quiet lanes past fabulous houses eastwards to the Red Cow pub in Sandwich. With the sun now shining we left the old streets of Sandwich to go past Richborough Roman Fort and weave our way along the little winding lanes beside Ash Level bordering the Isle of Thanet. 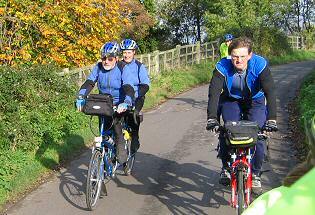 Our ride had been very flat so far but Peter threw in a couple of steep ups and downs before our return to Bekesbourne, where, having cycled 35 very enjoyable miles, we stood and chatted in brilliant sunshine before parting. 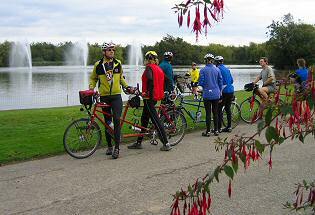 For our joint South East London and Kent November ride we gathered in the car park at the top of Ide Hill wondering if we were all quite mad! It was misty with a cold wind blowing - no chance of seeing the wonderful view usually available from this spot. We even had a new family bravely joining us for the first time. 5 tandems plus 2 solos, one with little Sammy chuckling in his child seat, set off briefly uphill and then down to try to escape the cold mist and sure enough once we were down in the valley it warmed up considerably and we could see the remnants of the beautiful autumn colours, more leaves on the ground now than left on the trees. 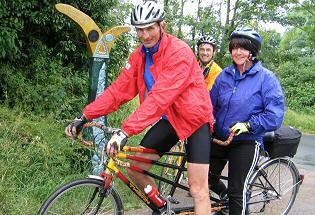 We went through the pretty village of Weald and then our leaders, Cliff & Pauline, told us to stop at Hildenborough Station and there was another tandem waiting to join us as pre-arranged, with another pair of first-timers to our group. We made our way to Quaintways Teashop in Penshurst for welcome warming coffee, chocolate and cakes and found two other groups of cyclists already well ensconced - a very good teashop for cyclists. As we'd spent rather longer than we should in the teashop our leaders decided to cut short the stretch to lunch and so after only 6 miles we arrived in Cowden for a very generous and tasty roast chicken lunch in the Fountain pub. Through Hever and on to tackle the long drag of Ide Hill to find ourselves once more back in thick mist in the car park having completed 28 miles. 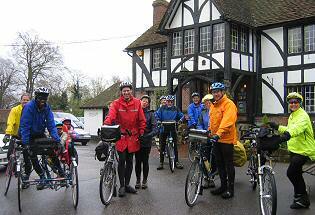 Most of us then proceeded to Cliff & Pauline's house to enjoy tea and cakes in front of a blazing log fire. as they appreciate having an idea of the numbers expected.